CCSA is Most Academically Focused! At last night’s ASFA Spring Ball, the Concordia Classics Student Association took home the title of “Most Academically Focused Member Association!” We’re thrilled to have been recognized for all our work organizing Brown Bag and Guest Lectures (as well as various other student and professor presentations) this year. And we want to thank all Classics faculty, CMLL staff, and, most importantly, participating Classics students (!) for helping make it a super productive and successful year. Best of luck on finals/enjoy the start of your summer, as the case may be! 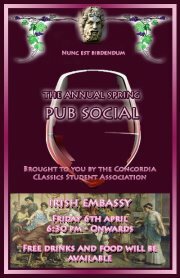 The CCSA invites you to join us in celebrating the end of the academic term and year at our Annual Spring Pub Social. It will be held at The Irish Embassy Pub (1234 Bishop Street), this Friday, April 6 from 6:30pm onwards. There will be plenty of FREE drinks (alcoholic and non) and food! All are welcome. And bring a friend! Congratulations to the newly elected CCSA Executive for the 2012-13 Academic Year! Many thanks to all who voted! The first day is going really well! There are some really interesting presentations and a great turn out. Don’t forget we continue with more presentations tomorrow. It will take place at the Universite de Montreal. The presentations take place from 9 am – 5:30 pm. Salle 580-31, 3744 rue Jean-Brillant, Universite de Montreal. Come and support your fellow students. The full brochure can be found online, but here is a list of the Concordia students who will be presenting. Reception at Universite de Montreal, there will be free drinks and food available. Hi all! We have found a room for Dr. Jane Francis’ keynote on Thursday March 22 from 6pm-7pm: McGill University, ARTS Building, room W-120 (AND NOT in the Hall Building’s H-531). Here is an updated program of events: Montreal Classics Colloquium 2012 UPDATED Brochure. We hope to see you all there!! Classics Enthusiasts! This Thursday and Friday (March 22nd and 23rd), Concordia, McGill, and UdeM are hosting the 4th Annual Inter-University Montreal Classics Colloquium. The final schedule for the event is found here: Montreal Classics Colloquium 2012 Brochure. ***PLEASE NOTE: Following the very recent news that Concordia University will be closed on March 22nd due to the provincial-wide student strike/march, we are looking to have Dr. Francis’ keynote lecture relocated to the McGill or UdeM campus. Please check back here for updates regularly until Thursday! Many thanks for your patience! Next week, on Monday March 19 and Tuesday March 20, the CCSA is holding polling in room H-665 for its annual elections! Here are your candidates and their profiles. Please remember that although there is only one candidate for each position, they still need your votes to meet quorum and have the election ratified. If you don’t come out and vote, there will be no CCSA next year! Please show your support – VOTE! VP Academic: Karolina Saghafi. VP Academic Profile. Get Credit for Archaeological Fieldwork!